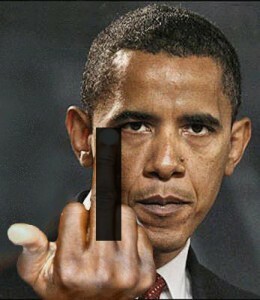 Obama Flips Bird and says, "no"
Barack Obama announced Wednesday that he will kill the 50,000 potential jobs the Keystone pipeline would provide by denying the permit necessary. Obama further had the audacity to blame Republicans for imposing a “rushed and arbitrary deadline” because no matter what, he HAS to blame Republicans. That’s the Obama Mantra. Obama continues to not allow truth or facts to get in his way. GOP lawmakers immediately responded by basically saying Obama has, yet again, hurt America with this decision. House Speaker John Boehner said Obama is “selling out American jobs for politics.” Despite Obama’s job killing decision, Republicans vowed to push Congress to make the pipeline happen. Obama’s own jobs council agrees with the building of the Keystone pipeline saying that it would improve competitiveness. The council said that when it comes to energy projects in general, the government needs to “expeditiously move forward on projects that can support hundreds of thousands of jobs.” But even that advice did not help to waiver Obama’s hard line decision to block these jobs claiming that it is counter intuitive to his “Destroy America” plan. Obama has consistently stood by his failed environmental ideals, despite their continued failures, hello Solyndra, and noted his environmental concerns when it comes to energy exploration. Apparently Obama believes the wind and sun will be efficient to keep America going. Obama is hoping that gas prices will reach an optimum of $5.00/gallon in order to push more failed green energy policies that line the pockets of friends and send money back into the Democratic party. President Obama has used his position as President of the United States for wealth gain. Prior to becoming president Obama had never held a job before and wasn’t exactly rolling in dough. After Obama blamed congressional Republicans for trying to rush him TransCanada was invited to reapply, an overture the Calgary-based company promptly said it would accept. Obama’s denial of a permit strategically pushes the final decision on the Keystone pipeline into 2013, safely past the presidential election. Obama repeatedly has put politics in front of the interests of the American People. John Stephenson, who helps manage $2.7 billion for First Asset Management Inc. in Toronto, said he bought 350,000 shares yesterday as TransCanada fell the most in 18 months. We wonder how many shares Obama got? Obama acted before a Feb. 21 deadline Congress set after he postponed a decision to allow for a review of of a revised route through Nebraska. TransCanada said the 1,661-mile (2,673- kilometer) project would carry 700,000 barrels of crude a day from Alberta’s oil sands to refineries on the U.S. Gulf of Mexico coast, crossing six states and creating an estimated 20,000 jobs. Obama called Canadian Prime Minister Stephen Harper, who told the president Canada will seek to diversify its energy exports after Keystone was rejected. Harper “expressed his profound disappointment” with the Keystone decision, according to a statement from his office. Currently, 99 percent of Canada’s crude exports go to the U.S., a figure that Harper wants to reduce in his bid to make Canada a “superpower” in global oil markets. Canada this month began hearings on a proposed pipeline from the oil sands to the British Columbia coast, where it could be shipped to Asian markets. The State Department said in a report to Congress yesterday that the pipeline would create 5,000 to 6,000 construction jobs during the two years needed to build the project, based on labor expenses TransCanada included in its application.